On this day, April 12, 1907, author and animator Hardie Gramatky was born in Dallas, Texas. After studies at Stanford University and at the Chouinard Art Institute, his skills as a watercolorist found him hired as a senior animator at the Walt Disney Studios, a job that lasted six years. 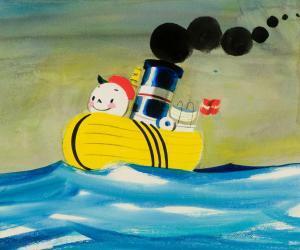 Later Gramatky worked as an illustrator and an illustrator-author for a series of children’s books, such as Little Toot.